Along the way you will pass the stunning regenerated waterfront, ride under the city's many iconic bridges and get an insight into the heritage of one of England's most historic industrial areas. There are two routes, 10 and 15 miles. Both are flat and on largely traffic free paths, trails and minor roads. Marshals and comprehensive signage help you to navigate. 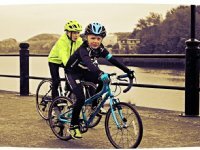 The riders are suitable for almost anyone who cycles and an ideal opportunity to cycle with family and friends. The entry fee is £10 for all riders. Starting at the Cycle Hub, Ouseburn, on the North bank of the Tyne, participants ride upstream along Sustrans Route 72 passing under the Tyne Bridge, Swing Bridge, High Level Bridge, Redheugh Bridge and on towards Scotswood Bridge. Along the way riders will pass the regenerated river front of Newcastle, see much of the Tyne's industrial heritage, whilst looking out for famous landmarks such as Dunston Staiths and Vickers Armsrong Armaments Factory which was originally built by Lord Armstrong and at one time had a workforce of 30,000. 1/ Cross over to the south side of the Tyne and pick up Sustrans Route14 heading back to the start. On the way riders will pass the famous Gateshead Metro Centre and carry on towards the Sage Music Centre and the Baltic Arts Centre. 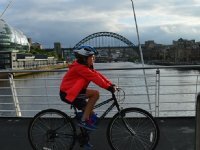 Riders will then ride over the Gateshead Millenium Bridge, turning East on the north bank of the Tyne to finish at The Cycle Hub. This ride is 10.5mls. 2/ Those wishing to go a little further than Scotswood Bridge will stay on the north side of the Tyne and keep heading west around the back of Newburn Business Park and on towards Newburn. At this point the route becomes almost rural and there is a complete change of scenery. Once reaching Newburn Bridge riders will cross over the south side and pick up Sustans Route 14 heading east. This will take them back towards Scotswood Bridge where they will join up with the riders completing the shorter route. This ride is 15.5mls. Both routes are fully signed with marshals to direct riders at critical points. St John Ambulance medical staff will also p atrol the routes on bikes.St John Ambulance medical staff will also patrol the routes on bikes. 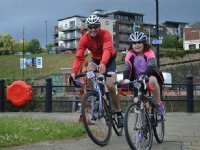 Registration/Sign-on Details: On the day, registration/sign-on for the Tyne 6 Bridges rides is open from 4pm and until 7.30pm. 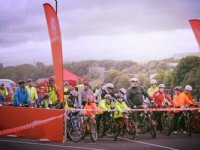 All riders aged 14 and over must sign on individually. Parents/guardians of children under 14 must sign on their behalf. All riders under the age of 14 must be accompanied by an adult. Any adult may accompany more than one child. Sign-on is compulsory before taking part in the ride - its is a requirement for insurance purposes. Start Times: Riders can choose on the day which ride they wish to do. Riders will start in groups of approximately twenty from 6.15pm onwards. There are no allocated start times - start whenever you want after 6.15pm. All riders must complete their chosen ride by 9pm. The Finish: Upon finishing all riders will receive a T-shirt and Goody Bag. There will also be official photographers around the routes to take pictures of riders.